events have generated funds allowing the group to donate more than $900,000 to ovarian cancer research and education in Northeast Ohio. is a not-for-profit, volunteer-driven, 501(c)(3) organization. How Can I Support OROC? Become more knowledgeable about ovarian cancer. Please Contact Us to find out to more about OROC support opportunities. 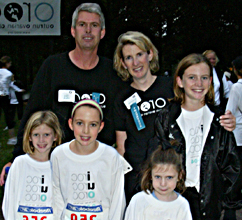 OROC founder Gretchen Nock, husband Tom and their four daughters.